Here is the classic Purple Dino. 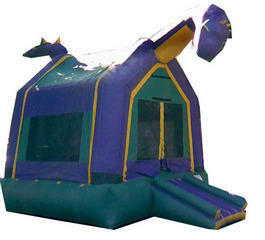 It was one of the originals themes from the early days of the inflatable industry. 1. Your setup location needs to be free of rocks, pet waste, sharp objects or any other hazard. 2. Unit must have a clearance of 4 feet in all directions. 3. Please make sure that you have a clear spot for us to park and unload. Setup location should be no more that 100 Feet from Delivery truck. Pathway to setup area should be level and easily accessible by hand-truck. Please let us know in advance if there will be any steep inclines or stairs. Additional fees may apply. 4. Please remove garbage cans or any other obstruction that may be in the pathway to the setup area for your inflatable or other party items. 5. Our Delivery drivers are on a limited time schedule. Please be ready for them when they arrive. If you are paying your balance with cash, please have exact change ready. Delivery drivers do not carry change. 6. Please be aware. Due to scheduling and routing“ We may arrive at your location as early as 7 or 8 am “ even if your party or event is late in the afternoon. If you require special scheduling please make a note in the customer comments section or contact us. Pre- cleaned/sanitized unit. Unit is cleaned in our shop or by the delivery driver at the time of setup. Staking or Sandbagging "Staking Prefered"
Extension Cords. We will supply the extension cord or cords required to setup your inflatable. "Keep in mind that we can only go 75 foot max." Safety Training. Delivery driver will go over safety rules and operation of inflatable.